The earliest recording its been my pleasure to come across so far. Clearly its not comparable to an FM radio or soundboard recording as such but is a wonderful snapshot of a historic moment in musical history. Elvis Presley live in concert after the release of his huge hit single Heartbreak Hotel. Recorded by a radio DJ (who you can hear on the recording here and there), the recording was rather muddy and DJ Fontana on drums was almost unheard - I've done what I can to bring out the instruments and reduce noise and its certainly very listenable. As you can see Hound Dog appears twice, once as the normal speed version and once as a slower reprise - which was probably an excellent excuse for Elvis to gyrate his hips, judging by the amount of screaming from the girls in the audience! As a bonus, the recording closes with a brief interview with Elvis backstage after the show - hardly in depth but certainly an interesting historical piece. Incidentally, when I originally broadcast this show, a listener sent me this photo which was actually taken at the same show. Helps bring the recording to life a little! I got this show about ten years ago, but you've improved it a lot with your clean-up. 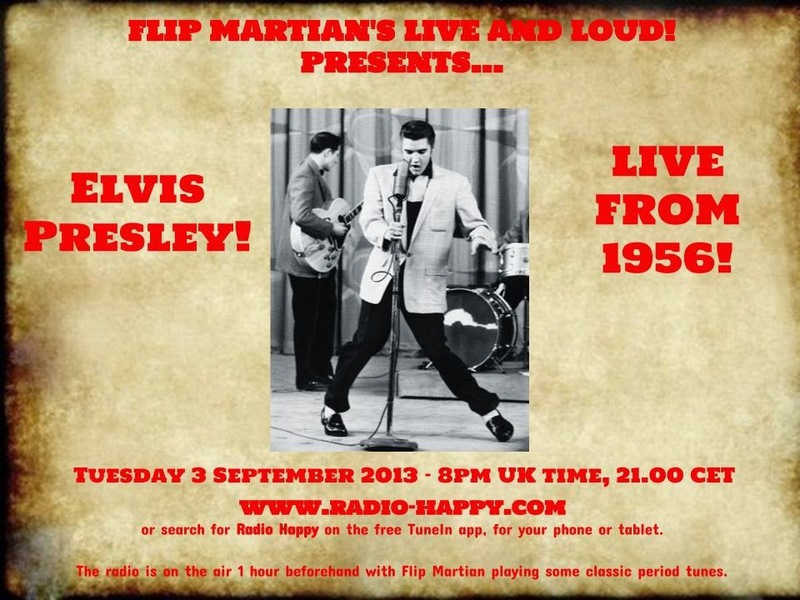 First ever full length recording of Elvis Presley, live in concert. Features only the 2nd public performance (and earliest recording) of Hound Dog. "You can steal my wife, burn my car" becomes, "You can burn my wife, steal my car". In "I was the One", "She broke my heart" becomes, "She broke my leg". Especially interesting because Hound Dog is the earliest recorded performance of the song, and in fact, this was only the second time he had performed HD, the first being the previous night's show. A couple of weeks later he sang Hound Dog on the Milton Berle Show, complete with bumps & grinds, and EP became famous nation-wide. The studio version of HD was to be about 6 weeks in the future. 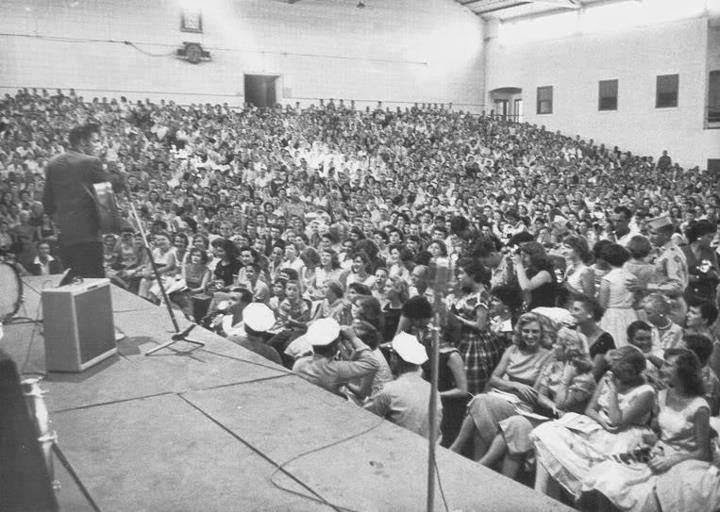 A twenty-one-year-old Elvis Presley takes the stage of the Robinson Memorial Auditorium in Little Rock, Arkansas. It’s May 16, 1956, and local disc jockey Ray Green is on the air for a live broadcast: “He’s winding up his legs, and here he goes with—‘Heartbreak Motel’!” “Here’s a song that’s real hot around the nation and some parts of Africa,” Presley says to introduce the next number. “A song here recorded by a—friend of mine,” he says, bending the last three words with an odd affection, almost twirling them. The friend is Little Richard (“I never met him”), the song is “Long Tall Sally,” and Elvis is instantly ripping it to shreds, rushing far out ahead of his band. Little Richard told a funny story, watching from the alley as Uncle John chased Sally out of her wig and Aunt Mary caught them; Elvis makes it clear that it’s the man singing and no one else who’s got his hands all over Sally, and who’s not letting go. “We’ve been doing this song for about twenty-five, thirty years, around the country,” Elvis says to introduce “Blue Suede Shoes”—a riff he would use from the beginning of his career to the end (“One of the first records I recorded, back in 1927, I think it was,” he says in 1969 in Las Vegas, “just before the stock market crashed”), as if it signified that the music he was making was nothing new, that it had always been present—or that he had. “You can burn my wife, steal my car, drink my liquor from an old fruit jar,” he laughs in the middle of Carl Perkins’s “Blue Suede Shoes”—and with a momentum that stops you cold: did he just say that? For the Drifters’ “Money Honey”—in the original, as explosive a record as early rock ’n’ roll produced—the shouts that Elvis shoots over the dark guitar chords that start the tune clear the ground, and with a looseness, a confidence, that is so strong it hardly makes sense. It’s a moment that comes from the place Bob Dylan found when he read Peter Guralnick’s Last Train to Memphis: “Elvis as he walks the path between heaven and nature in an America that was wide open, when anything was possible, not the whitewashed golden calf but the incendiary atomic musical firebrand loner who conquered the western world.” “Very good, Elvis,” the disc jockey shouts as Presley leaves the stage. An aura of unlikeliness comes through the rough performance and the holes in the sound. You hear a young man taking steps that did not have to be taken; you hear him communicating pleasures for which there was no language but his own. You hear the screams from the crowd, and in a certain mood you can hear the person behind each scream, and you wonder: Did she know? Did she understand? Was she changed? Did she change back? So, thanks for the cleaned-up concert and pic, and I hope you find something useful here. Eric - it was a thrill to find this recording originally, and a privilege to do my best to improve it. Glad you enjoyed it and many thanks for the extra information - its great to "fill out the picture" a bit more. There will probably be another Elvis show from late 60s/very early 70s at some point over the next few months (not quite as unique as this one though, perhaps!). Thanks for taking the time to write.